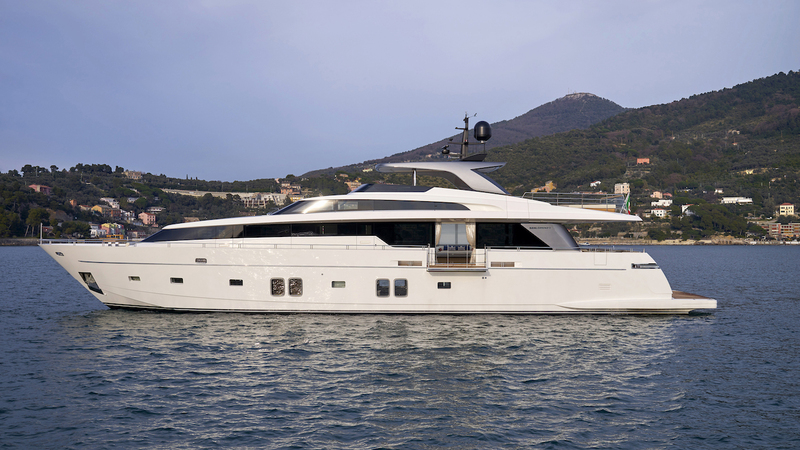 DINAIA is a 32.20m (105' 8") motor yacht built by the Italian shipyard Sanlorenzo and launched in 2018. 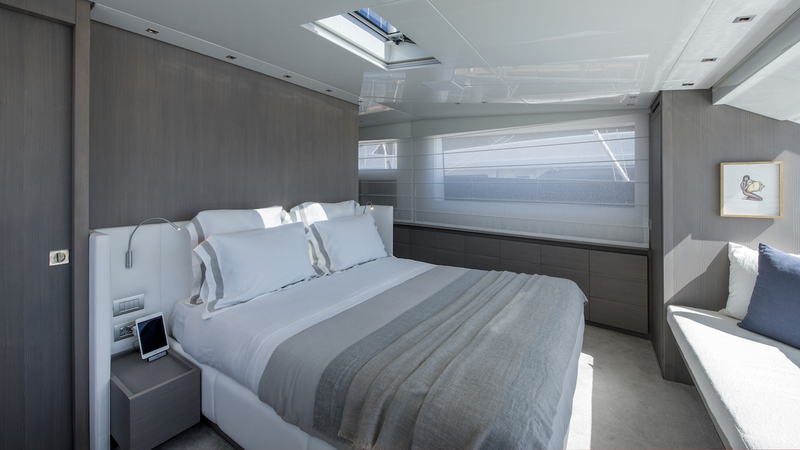 With modern and elegant interior design by Amellie Gillier she is able to accommodate up to ten guests in five staterooms. She has a crew of six on board. 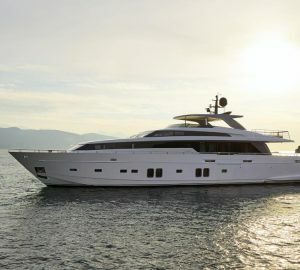 The spacious swim platform on the lower deck is used for storing a jet ski when in transit, and the stern door opens up to reveal the tender garage inside. 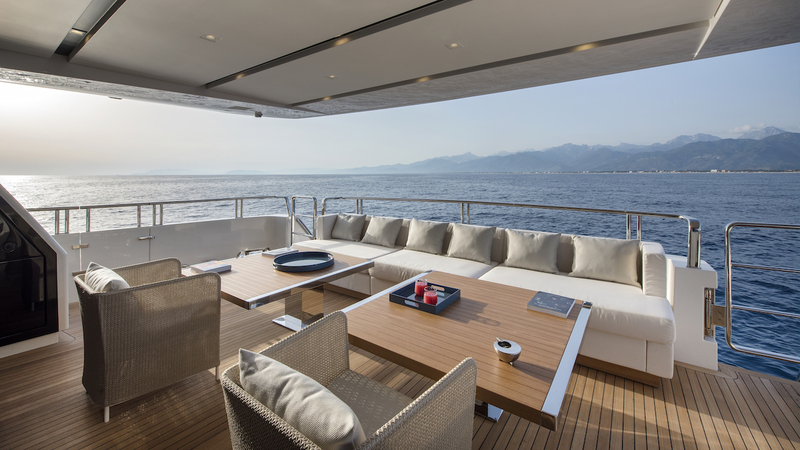 Two staircases lead up to the main deck, where there is a sofa along the stern and two tables and two armchairs placed beneath the upper deck overhang. A port staircase leads to the upper deck, where a spongy double sunpad can be found to the stern with a sofa/sunpad to port and starboard. 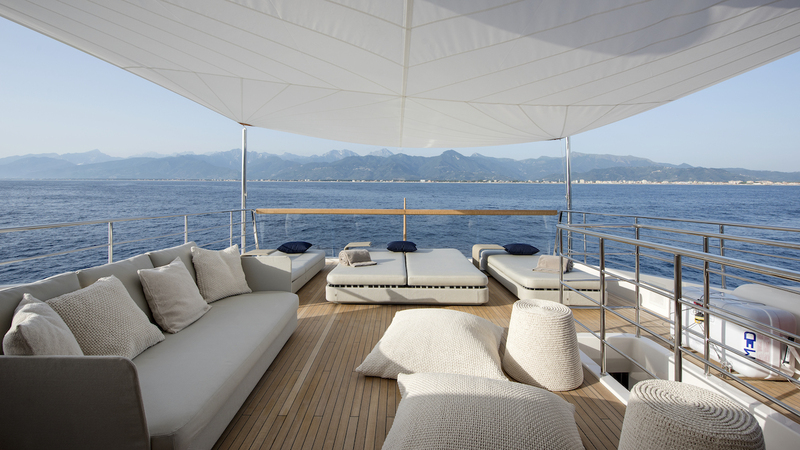 A canvas shade can be placed above which also covers the sofa and cushions amidships. 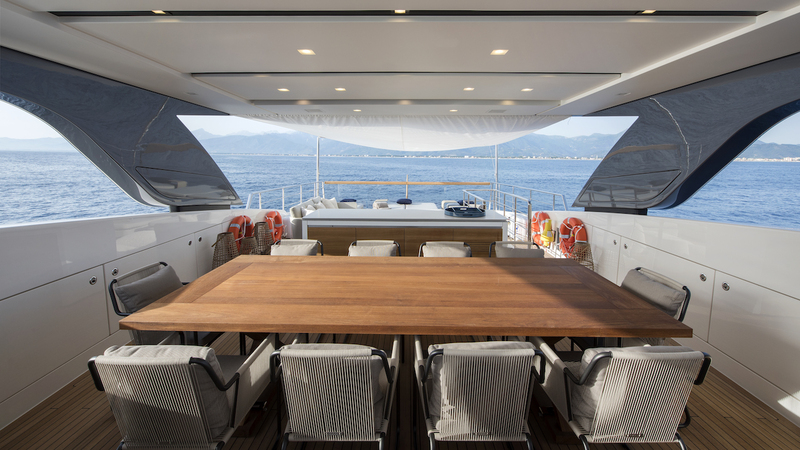 A wet bar and alfresco dining table to seat 10 are placed beneath the hardtop, with seating for a captain and co-pilot placed in front of the helm station and to starboard. 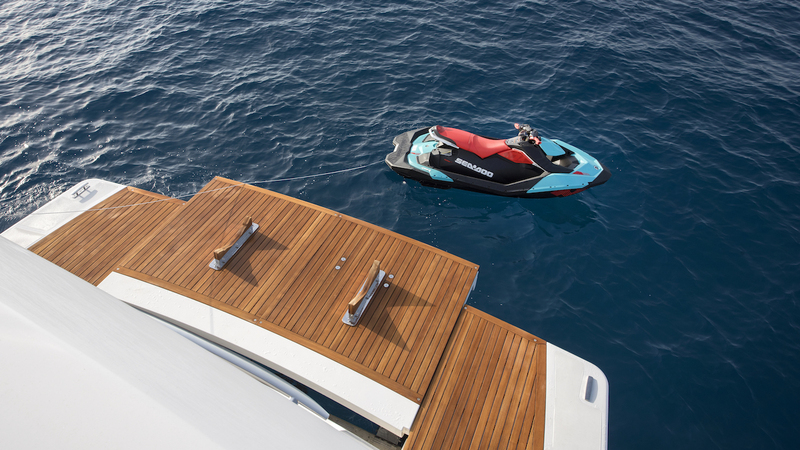 On the lower deck the stern contains the tender garage, which stores the 4.5m/14.7ft tender and jet ski. 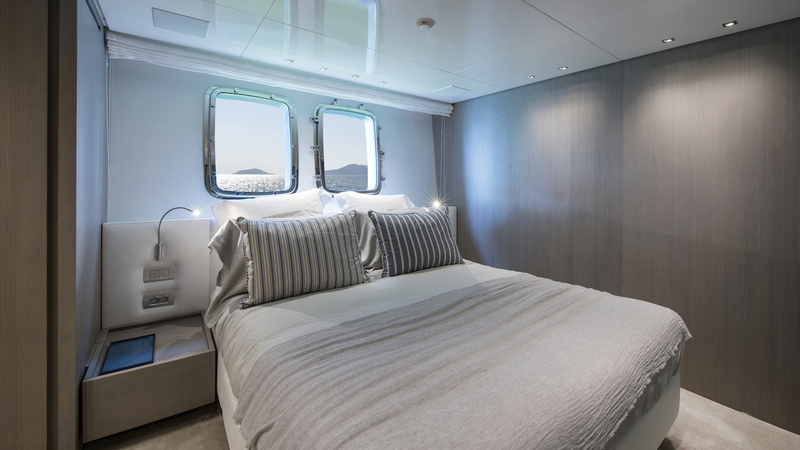 The engine room is aft of amidships followed by the guest accommodation with a VIP stateroom and double cabin on each side. The forward section and the bow contains the crew accommodation. 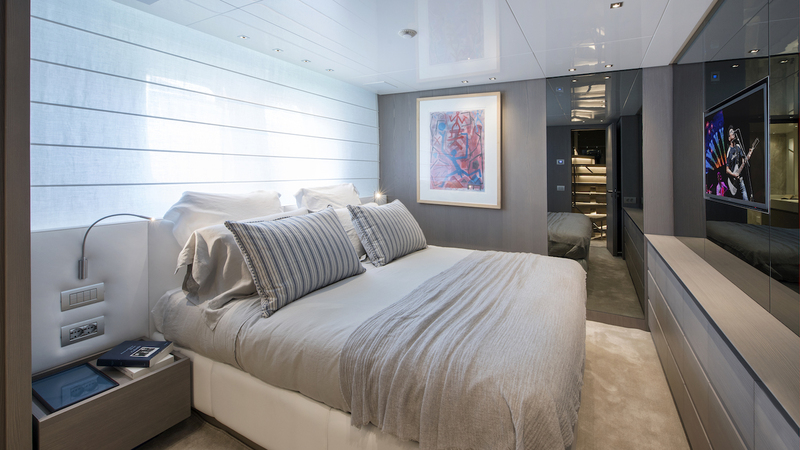 The Master suite is positioned on the main deck forward and is accessed via a corridor to port off the formal dining area. Inside, there is a walk-in wardrobe, a desk and a large bathroom behind the Master bedroom. 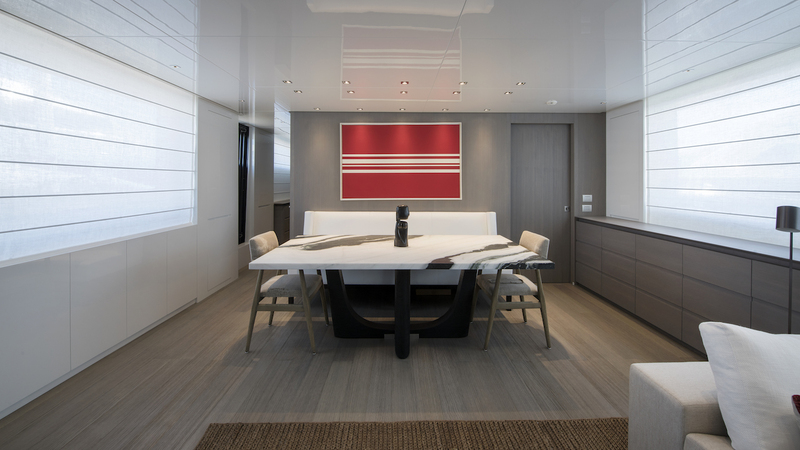 The main foyer and galley is placed amidships with the formal dining area immediately behind, providing a minimalist environment for the group to enjoy a meal in air conditioned surroundings. Behind, a sofa and two coffee tables form a casual lounge with a TV concealed in the cabinetry opposite. 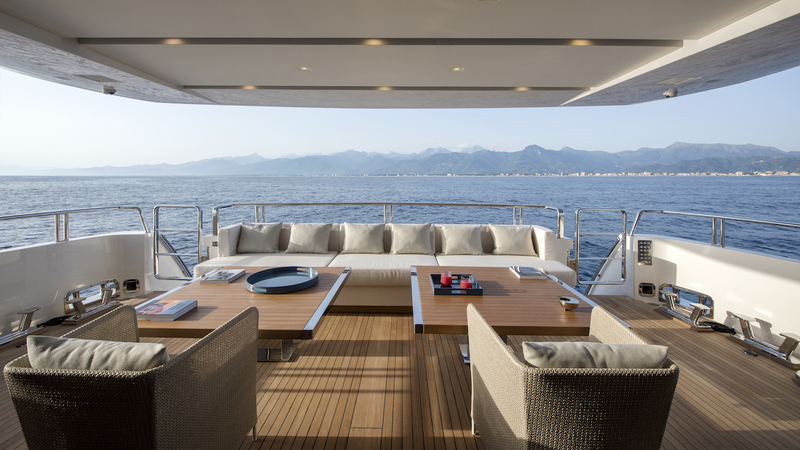 Large windows run the length of the room for a naturally lit environment with spectacular views of the destination. 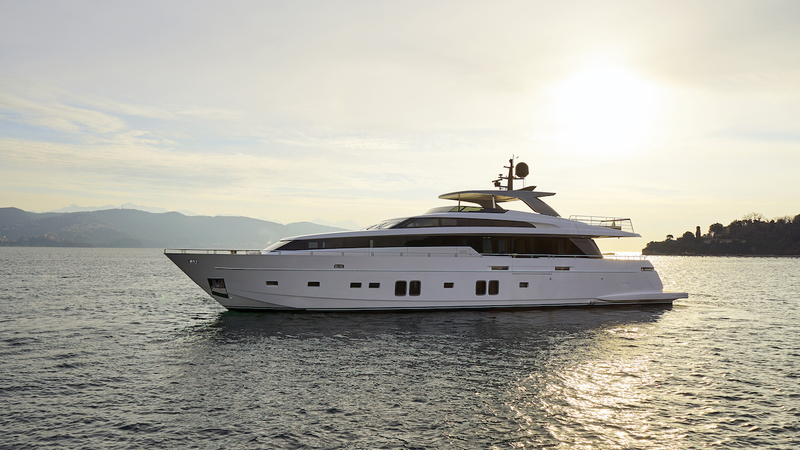 Twin MTU 16V 2000 M93 engines produce a top speed of 30 knots and a cruising speed of 23 knots. The accommodation sleeps a maximum of 10 guests over 5 en-suite cabins: 1 Master suite, 2 VIP staterooms and 2 double cabins. 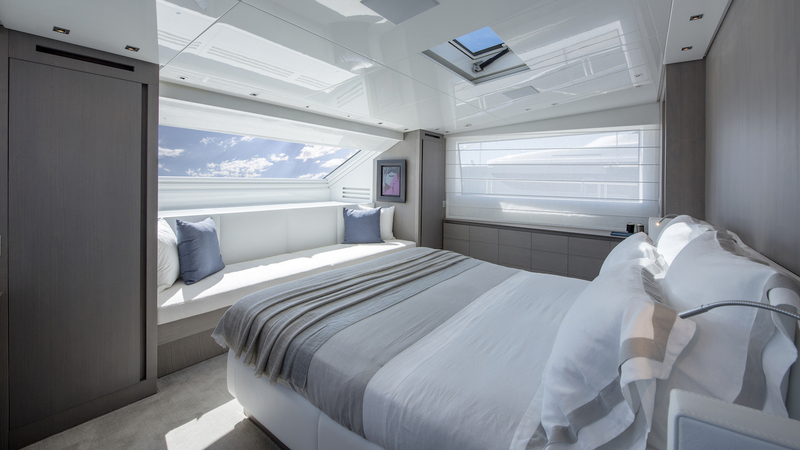 The main deck forward Master suite features a walk-in wardrobe, writing desk and large bedroom with forward windows and skylights for an abundance of natural light. 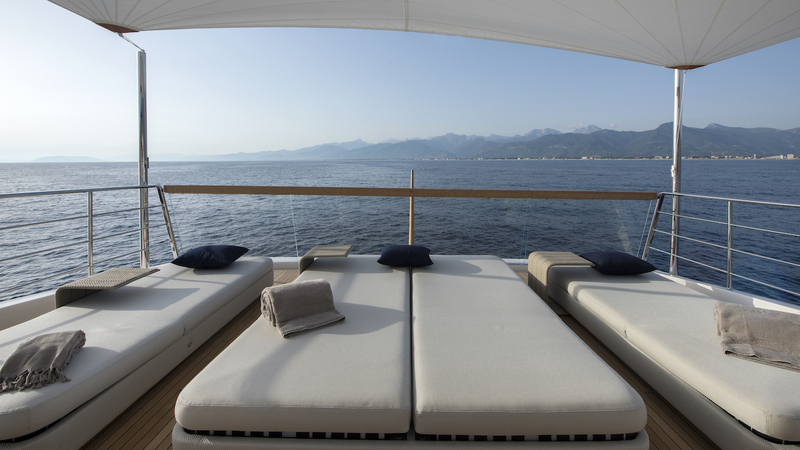 A daybed is fitted beneath the forward windowsill, where a widescreen TV is concealed when not in use. The bathroom behind the bedroom is fitted with his-and-hers sinks and a shower. 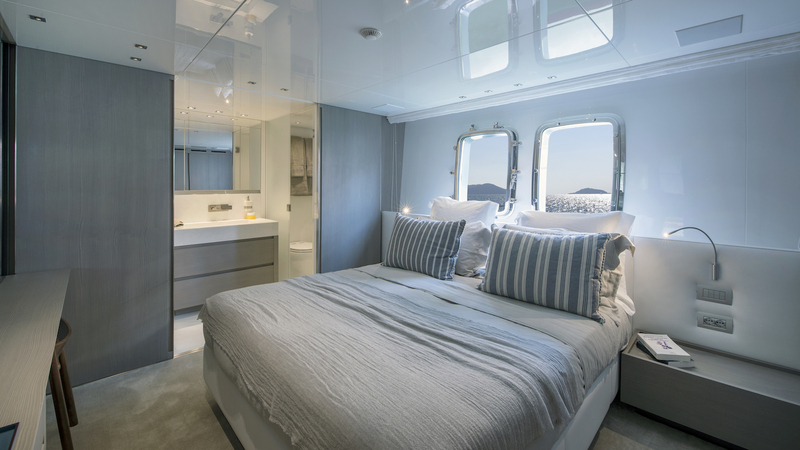 The VIP staterooms both have a deck/vanity along with a large wardrobe. 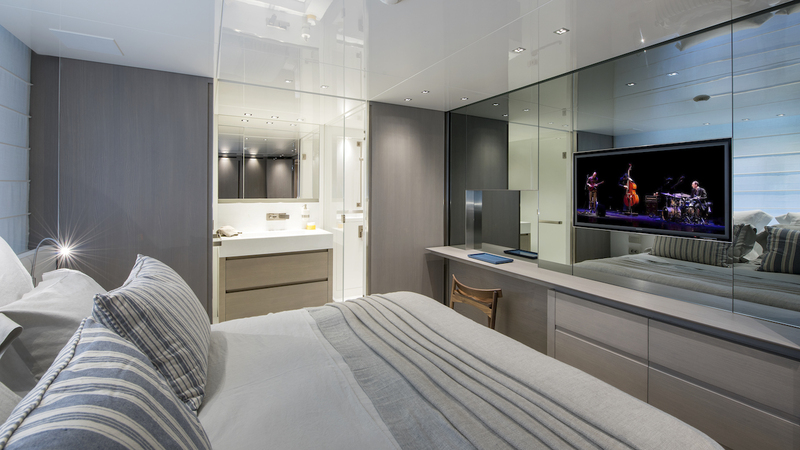 A widescreen TV is mounted on the forward wall and the en-suite bathrooms contain a sink and large shower. 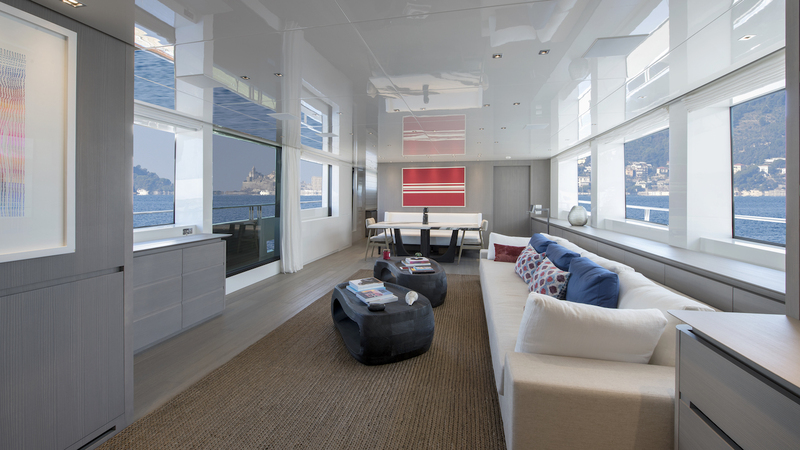 The double cabins use the same layout as the VIP cabins, but without the desk/vanity.